That is where they should be. Now put the foundations under them"
If you were opening a brick and mortar business, you'd be sure you have a plan before signing a lease, buying product and opening your doors. 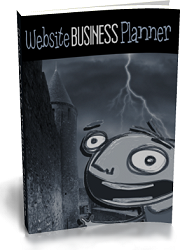 Most website owners don't plan for their website's success... which explains why websites seldom succeed. Success doesn't happen by accident. 95% of websites could go offline and no one would miss them but their owners. Do you know the first mistake that website owners make? Do you know how to calculate the finacial viability of your idea? Do you know a really quick and dead-on effective way to see if your pricing is right? Do you how to use a simple chart to figure out where your traffic will come from?